A small 2014 Christmas thank you from PHAB to our wonderful small group of voluntary drivers - who help to make PHAB the success it is! Many families do not have their own transport. 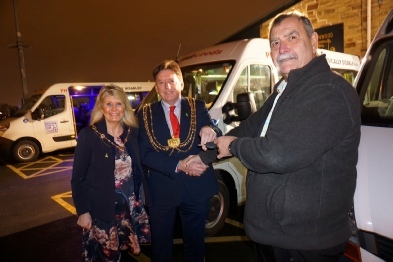 PHAB’s work of helping people with a disability is possible as we have four of our own specially adapted ambulances to ensure disabled members travel in comfort and safety. As the PHAB vehicle arrives at the door … the fun begins. PHAB arranges training in MIDAS, Basic First Aid, Moving & Handling and Safeguarding. WE REQUIRE HELP FROM VOLUNTARY DRIVERS. We have two new vehicles but are short of drivers – some have retired and others moved from Leeds. Have you some time to spare on a Friday evening? The Prince Philip Centre PHAB Club cares for people of all ages who have a physical disability, mild learning disability or life limiting illness alongside able bodied buddies. Members meet on Friday evenings and on PHAB outings, residentials and playschemes for friendship and fun. 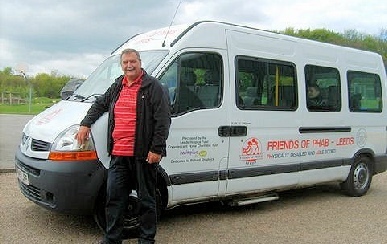 The charity is looking for reliable volunteers to drive PHAB vehicles on Friday evenings between 6.00pm and 10.00pm and for other events. We collect members from home and take them to the PHAB Club in Leeds 7. Volunteers must be fit, with a clean licence, aged 25 to 70. PHAB asks for two current referees, and will organise DBS and training in safe-guarding, MIDAS (MInibus Driver Awareness Scheme) and basic first aid. They also have the opportunity to take part in PHAB activities, outings and residentials throughout the year. There are rotas and each voluntary driver collects members from a different area of Leeds. For further information, please email Ann Hart, PHAB Secretary, or visit our contact page. It was an exciting evening at the PHAB Club one dark evening in February during the official presentation of our two new vehicles. We were joined by the Lord Mayor and Lady Mayoress of Leeds and a number of Patrons for the celebrations. See more pictures on our presentation page. He takes care of all the PHAB transport arrangements, arranges the weekly transport lists, and is the person to contact if you want PHAB Transport in Leeds. Peter also takes care of recruitment of voluntary drivers, and is responsible for the maintenance schedule of our vehicles. 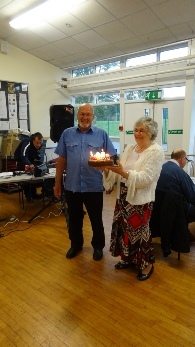 Although retired – Ken B (celebrating his birthday) and Dave G are still active members of PHAB.